Six months after Occupy Wall Street began – when a few hundred people sparked worldwide protest with a march and sit-in in lower Manhattan against political corruption and corporate greed – OWS was back. And four months after Occupy encampments were brutally evicted around the country, the police were there to greet them. Demonstrators chanted “this is what democracy looks like” as cops dragged scores out of Zuccotti Park in downtown Manhattan. More accurate would have been “this is what a police state looks like.” At the same time, the sharpening internal contradictions within the Occupy movement were also on display. 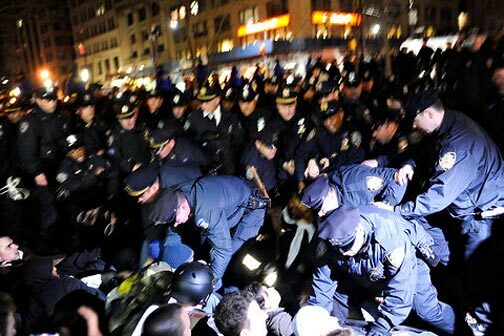 NYPD wades into crowd at Zuccotti Park on March 17, arresting scores. Cops part of the “the 99%”? Police are part of the armed fist of capital. Mobilize workers’ power against racist police brutality. Meanwhile, meeting a few blocks away was the annual Left Forum. This year’s theme was “Occupy the System: Confronting Global Capitalism.” But when 30 to 40 Occupy activists showed up at the gate, they were blocked from entering by security guards under instructions from Forum organizers, because they wouldn’t pay the outrageously high entrance fee. Rightly denouncing the “fake left,” the Occupiers marched back to Zuccotti Park, only to be busted by the NYPD a few hours later. The next day, the liberal/reformist gab fest was addressed by Chris Hedges, a Cold War anti-Communist who has denounced “black bloc” anarchists as a “cancer” and “criminal” for supposedly seeking to “hijack” and “destroy” Occupy. Clearly, fissures have begun to show in the “99%,” in the populist vocabulary of OWS. Only a few months ago, Occupy Wall Street was being hailed as the greatest movement since civil rights. Occupiers chanted, “We are unstoppable, another world is possible.” (What kind of other world was not specified.) At its high point last fall there were over 600 Occupy groups around the U.S., up to 1,000 by one count. They mushroomed in the space of a few weeks because OWS crystallized widespread anger over the obscene spectacle of bankers, who had triggered the worst economic crisis since the 1930s, looting billions more as mass unemployment persisted. Many saw it as a continuation of the labor upsurge in Wisconsin and the popular revolts in Egypt and Tunisia earlier in 2011. Barely half a year later, Occupy is splintering left and right. This was inevitable in a movement that was united only in what it opposed and could never put forward a positive program, whether of reformist “demands” on the capitalist state or of revolutionary action against it. The question is: along what lines will it polarize? The bulk of the left, meanwhile, sought to bury itself in the Occupy movement. In New York, OWS was started in reaction against left groups such as the Workers World Party (WWP) and its various offshoots. So others on the opportunist left such as the International Socialist Organization (ISO) were notably hush-hush about their affiliations, and told supporters of the Internationalist Group selling our paper at Zuccotti Park was “not appropriate.” Many social-democratic and Stalinist reformists tried to give the populist slogan of “99%” a veneer of class content by claiming that the 1% is a synonym for the capitalist class. On the West Coast, where Occupy groups have been more left-wing, the encampment in the renamed Oscar Grant Plaza in front of Oakland City Hall was dubbed the Oakland Commune. The all-sided love fest (even extending to supporters of right-wing Republican Ron Paul) was extremely brief. From the outset, many OWS activists were wary of being co-opted to the Democrats, which of course was exactly what the liberals and labor leaders were after. Certainly, if anyone is trying to “hijack” Occupy, well-funded liberal operations like Moveon.org are right up there at the top of the list. And the effort to put an Occupy label on re-elect Obama efforts is continuing, in the form of outfits like “Occupy Congress” and “Occupy the Dream.” OWS protests against fundraising events for Mitt Romney call the Republican front-runner “Mr. 1%.” As if Barack Obama (2011 reported income $1.73 million) isn’t? As the encampments in city centers persisted and multiplied last fall, the ruling class became increasingly irritated. Beginning in late October, big city mayors (overwhelmingly Democrats) launched a wave of coordinated evictions with help from Obama’s Department of Homeland Security. But what really tipped the balance was Occupy’s intervention in labor struggle. 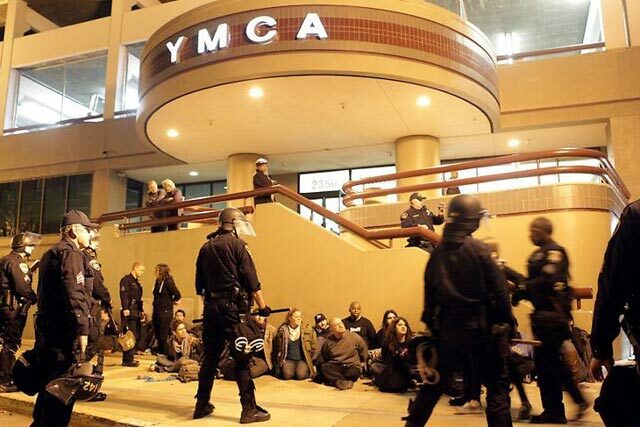 When Occupy Oakland called for a “general strike” on November 2 in response to a bloody cop eviction a week earlier, up to 40,000 people marched on the port and shut it down. Union bureaucrats and Democrats suddenly changed their tune. And when Occupy responded to the nationwide evictions later that month by vowing to do it again, the bourgeoisie went ballistic. In the lead-up to the mid-December West Coast port blockade called by Occupy, the media were on a tear denouncing wild-eyed anarchists trying to take over respectable unions. Left-talking liberals and reformists sternly lectured would-be radicals on the danger of substitutionism. When the ports of Oakland, Portland and Seattle were effectively shut down on December 12, the backlash against Occupy militants reached a fever pitch. The ILWU president warned against cooperating with outside groups in the fight against union-busting at the new EGT grain terminal in Longview, Washington (see “Longshore Workers, Truckers: Shut the Ports, Coast to Coast!” The Internationalist supplement, January 2012). In early January, the Obama administration announced it was ordering the U.S. Coast Guard to protect the first shipment from the EGT scab terminal. 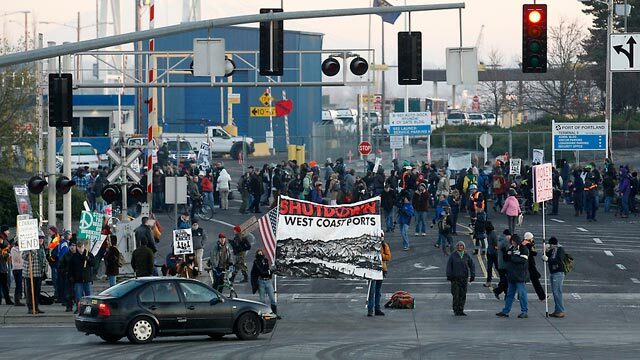 Rather than protesting this outrage, the longshore union tops ordered that there be no port shutdowns … and dispatched a couple dozen bureaucrats and hangers-on to bust up a Seattle forum called by Occupy for solidarity with the struggle in Longview. The heat was on, and soon “moderate” Occupy supporters began calling to purge radicals. Some sought to form squads of “peace police” to boot out anyone who would resist the cops. When Oakland police arrested 400+ demonstrators on January 28, the media and liberals denounced “vandalism” in City Hall by a few people protesting the mass bust. Following the November evictions, the highly visible Occupy encampments have been replaced by a mishmash of committees, coalitions, community assemblies (Occupy the Hood/ Barrio), etc. Occupy Homes groups have mobilized to stop evictions. In some places, Occupy labor solidarity committees have aided workers in struggle. Reformist leftists operate under an Occupy label (WWP d/b/a Occupy4Jobs) or through working groups (ISO in Occupy the DOE in New York). The more militant elements have formed collectives (e.g., Hella503, Portland Action Lab and Radical Caucus of Occupy Portland) and looser “anti-capitalist” blocs. Sometimes they act in concert, sometimes not, and under the rubric of “diversity of tactics,” everyone does their own thing. Occupy Wall Street did bring substantial numbers of white, middle-class youth – many of them disappointed Obama voters – into protest action and acquainted them personally with state repression. As the cops pepper-sprayed and mass-arrested demonstrators, the outrageous appeals to the police as fellow 99%ers became less and less frequent. There has also been some below-the-surface resentment of the “small-time bankers” in charge of OWS funds. But even the more radical activists have not broken from the bourgeois populism which is the point of political convergence of the diverse currents that make up the Occupy conglomeration (see “Expropriate Wall Street Through Socialist Revolution,” Revolution No. 9, November 2011). The “Declaration of Occupy Wall Street” (29 September 2011), speaking as the voice of “one people, united,” denounces greedy corporations and a tiny number of super-rich. Rather than a struggle of class against class, OWS presents a populist image of a united people – the “99%” – against a statistically defined tax bracket, the 1%. This populist rhetoric serves to divert protest away from struggle against the capitalist system and the ruling class as a whole. Some on the left have argued, in order to justify their opportunist policies toward OWS, that “99% and 1% can be defined in any manner desired. Marxists are free to define it as bourgeoisie and proletarian.” That sort of opportunist sleight-of-hand may make it easier to sidle up to politically undefined Occupiers, but it does not help the most thoughtful among them to see their way to a revolutionary political program that gets to the root of the social ills they are reacting against. It is necessary first of all to explain that the idea of eliminating, or even significantly curbing, the influence of money in politics while capitalism holds sway is far more “utopian” than a revolution overthrowing the production-for-profit system. But how do we get from here to there, any serious radical will ask, and what comes after? To begin with, it means breaking with the Democrats, ousting the labor bureaucrats and politically combating the misleaders who tie the black and Latino masses to the Democratic Party. It means unmasking the “NGOs” (non-governmental organizations) who act as a transmission belt for this partner party of racist American capitalism. And it requires building a revolutionary workers party against all the bourgeois parties, in order to fight for socialist revolution. liberals as well as social-democratic leftists complained of “vandalism” by some protesters in City Hall. A host of social-democratic left groups (ISO, Socialist Action, Socialist Alternative, Socialist Appeal, Socialist Organizer, Workers Action) have been assiduously courting “moderates” in the Occupy constellation. To do so, these reformists have taken up many of the battle cries of the liberals and labor bureaucrats. The ISO, in particular, scandalously excused the ILWU bureaucrats’ disruption of the Occupy Seattle labor solidarity forum, while the increasingly erratic centrist Spartacist League actually defended this attack on workers democracy (see “January 6: An Outrage in Seattle,” “‘Socialist’ Excuses for Disruption of Labor Solidarity Forum” and “SL’s Wrong Lessons of Longview,” Internationalist supplement, March 2012). A few weeks later, the ISO echoed the bourgeois press and liberals in screaming about “vandalism” by some Occupy activists. One article (“The Backlash Against Occupy Oakland,” Socialist Worker web site, 6 February) used the “v-word” five times, to describe what? 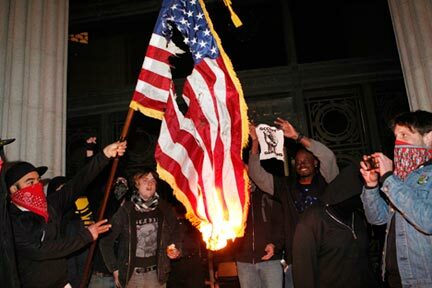 Some spray-painting in City Hall and “burning an American flag while the cameras rolled.” Horrors! This was labeled “irresponsible” and something “to be condemned” (“Discussing the Way Forward for Occupy,” 8 February). The ISO also condemned demonstrators using homemade shields to ward off blows from the cops, and “in retrospect” opposed the main purpose of the January 28 demos seeking to occupy an empty building to turn it into an organizing center. From the very outset, there have been sharp differences between the anarchist “occupy everything, demand nothing” crowd among the initiators of Occupy Wall Street and the social democrats who have repeatedly called for raising reformist demands aimed at improving the bourgeois state. The ISO complained early on about “an influential group within Occupy Wall Street that sees the occupation as prefiguring a future society – and that argues against raising any demands because that would only legitimize the existing power structure” (“A Spotlight on Wall Street Greed,” Socialist Worker, 28 September 2011). But the demands raised by the assorted social democrats in OWS do in fact call for reforming of the bourgeois state within the framework of capitalism. This is just a slightly more left-wing version of the policies of Democrat Franklin D. Roosevelt in the 1930s. Today Obama says his jobs program will create 6 million jobs, the Demands Working Group asked for 25 million. The workers movement needs to fight for jobs for all, but the issues we face today result from a crisis of capitalism. “Demanding” the capitalist government provide more jobs no more challenges capitalism than when American Federation of Labor leader Samuel Gompers summed up what trade unions want in the word “more.” And the call to “tax the rich” (an ISO favorite) is perfectly compatible with capitalism. Not only does mega-billionaire Warren Buffet call for a 30% minimum tax rate on millionaires, Democrats and Republicans just voted a New York state budget raising taxes on the rich. So what, the top marginal tax rate under Republican Dwight Eisenhower was 91%. But “Ike” was no red. Various anarchist and semi-anarchist groups wrongly consider the International Socialist Organization to be Trotskyist and equate its calls for “demands” with Trotsky’s Transitional Program. In reality, the ISO’s godfather Tony Cliff broke with Trotskyism in refusing to defend the Soviet Union during the post-WWII Cold War, justifying this betrayal by labeling the Stalinist-ruled USSR “state capitalist” (as does the ISO) against Trotsky’s insistence that it remained a bureaucratically degenerated workers state. The demands raised by this Transitional Program for socialist revolution are essentially calls for action by the workers movement, not the capitalist state. When Trotsky raises the demand for a sliding scale of wages and hours in order to combat mass unemployment and inflation, he is not asking the capitalist rulers to legislate a “welfare state.” He is calling on the workers to impose this in a struggle aimed at bringing down the profit system and prefiguring a socialist planned economy. Trotsky distinguishes his revolutionary call for expropriation and workers control of production from reformist calls on the government for nationalization of certain (usually bankrupt) industries or banks. Social-democratic and Stalinist reformists call for changing budget priorities, as with their demands for “books not bombs,” “jobs not war,” etc. Trotskyists insist that imperialist wars are not a question of policy but the inevitable product of the decaying capitalist system. Against these wars it is necessary to fight to smash imperialism through socialist revolution, calling for the defeat of one’s own imperialist government rather than nebulous appeals for “peace” or simply for withdrawal from a particular war. Such appeals are the staple of the popular-front “antiwar” coalitions that all the opportunists participate in, and are intended to draw support from bourgeois sectors who want to save the capitalist rulers from their folly. For a time, the social democrats’ bid to be a player in Occupy meant taking part in actions that were abnormally militant for this aggressively “peaceful, legal” crowd, examples being the December 12 West Coast port shutdown and the attempt by Occupy the DOE in New York to take over the mayor’s puppet Panel on Educational Policy with a “people’s mic.” But after getting nowhere with their calls for OWS to raise “demands” and in the face of growing bourgeois hostility to Occupy radicals, the ISO’s bid to recruit “moderates” out of the dwindling movement has meant shamelessly echoing the propaganda of the bourgeois liberals and pro-capitalist labor bureaucrats. This left some ISOers distinctly uncomfortable. “Ultra-leftism” is the big problem facing the left in the U.S. today?! What country are they living in? Obviously the ISO, SAlt et al. are worried that new layers of youth may be attracted to something more militant than the insipid reformism they peddle. But this also shows a fundamental misreading of the politics of the supposed radicals they are railing against. Even the more tactically militant sections of Occupy are politically populist, appealing to “the people united,” rather than working-class struggle. While social democrats may recoil at clashes with the cops, fearing it will cost them in “public opinion,” certain anarchist sectors revel in street battles – in good part because they think that media coverage of cops bashing protesters will gain them sympathy. With different tactics, both are playing for support from the liberals. So now we have the 2012 U.S. election campaigns running full blast. Despite Occupy complaints, money will play a bigger role than ever in deciding who will by president, with Democrat Obama aiming to spend over $1 billion, while the Republican Romney is shooting for $800 million, plus untold millions from corporate “Super PAC” political action groups. At this point in the normal election cycle, the reformists would be promoting some minor bourgeois “third party” or politician, such as the Greens or Ralph Nader (backed by the ISO in 2000 and 2004, begged by SAlt to run in 2008) or sidling up to the Democrat (as ISO did with Obama in 2008, repeating his “yes we can” slogans). However, this time around they are pretty much blocked. Some hoped for an Occupy candidate, but the political heterogeneity of the movement has ruled that out. While unable to tail shamelessly after Obama as imperialist commander in chief because of anger over his blatantly right-wing policies in office, the ISO also doesn’t want to be held responsible for siphoning off potential Democratic votes to make possible a Republican victory (as Nader was in 2000). SAlt, meanwhile, produced a truly tortured election perspectives document saying that while a workers party would be nice, they would support a left populist (capitalist) candidate, except they still can’t find a “dynamic contender” (“Socialists and the 2012 Elections,” 25 March). So despite their ingrained electoral opportunism, all the social democrats have on offer this time around is “systematic and patient organizing” for “struggles – large and small” (ISO). A handful of left groups (SPUSA, PSL, SEP, FSP) are ritually running their own candidates, on indistinguishable reformist programs. This is hardly appealing to youth who thought they were taking to the streets to fight Wall Street. And, while the pseudo-socialists may denounce Goldman Sachs and even timidly criticize Obama, they do not call, as the Internationalist Group does, for a fight for the political independence of the working class from all capitalist parties and politicians, and to build a revolutionary workers party that can overthrow capital. Clueless in the class struggle. A strike is a collective action by the workers, not an individual click of protest. 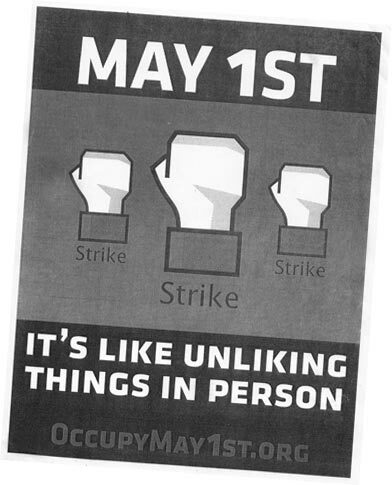 Poster for May Day 2012 at City University of New York. In contrast to the hapless opportunists, in Occupy Seattle, Occupy Portland and Occupy Oakland there are groupings that are distinctly hostile to bourgeois electoralism, but also to trade unions and “politics” in general. In our experience, some of these would-be radicals are quite full of themselves, know-it-alls who know nothing – or very little – about the class struggle, and treat workers with petty-bourgeois arrogance. Others seem to be grappling with real problems encountered in the struggle, yet drawing radically wrong answers. During the December 12 port action, some anarchists and semi-anarchists cursed port truckers, spitting on their trucks and treating them as scabs rather than asking for their solidarity in a blockade that was not a union action. This put the success of the port shutdown at risk, threatening to pit blockaders against workers – which the bosses and their media would love. Incidents of this sort occurred at least in Oakland and Portland, Oregon but in Portland class-conscious trade unionists were able to defuse the potential confrontation (see “Why Labor Solidarity Matters: Lessons from Portland’s D12 Port Blockade,” in this issue). Some who would consider themselves class-struggle anarchists and anarcho-syndicalists – particularly, but not exclusively – in and around the IWW (Industrial Workers of the World), do not share the anti-worker and anti-union prejudices, although they do oppose parties, “politics,” etc. However, others among the Occupiers have elaborated a whole ideological construct justifying action by the unemployed, the homeless and lumpenproletarians independent of and potentially against the unions and employed workers. What countries might those be? The United States? Nonsense. The U.S. is today producing more industrial goods than ever, just with fewer workers. This only makes industrial workers more powerful, rather than less. Witness how big business raged against the West Coast port shutdown threatening just-in-time production and distribution schedules. Yet union misleaders justify their capitulation by claiming they lack the strength to fight. In reality, what’s lacking is the will and program. With such supposed “radicals” there is really nothing to discuss. They pretend to speak for the unemployed, the unorganized workers, lumpenproletarians, etc. – but their class outlook and visceral hatred and contempt for the organized workers movement reflect the views of the privileged middle class. Their disdain for unions and employed workers in general is such that it could lead them to act as instruments of right-wing labor bashers – and to be treated accordingly. Moreover, they are oblivious to the fact that their “motley band” of unemployed union-haters could never have shut down the ports. Without substantial support from working people and union members they would have been crushed by state repression. Unions Today: A “Labor Aristocracy”? One might have that superficial impression in places like Seattle and Portland, but the writers seem to have missed the fact that in San Francisco/Oakland, a union stronghold, the ILWU is predominantly black and in Los Angeles it is heavily Latino. In New York City, the powerhouse of local labor, Transport Workers Union Local 100 – which shut the city down with its “illegal” 2005 strike – is also heavily black, Latino and immigrant. Nationwide, black men and women are significantly more likely than whites to be union members. Latino union members have wages that are 50% higher than non-union members, they are twice as likely to have health insurance and three times as likely to have a pension. Although there is plenty of discrimination that must be fought, it’s inaccurate to portray unions today as simply white male job trusts. Most ILWU longshore workers, for example, are dispatched from the hiring hall and receive wages no higher than many city bus drivers. If their annual income is higher it is because of tons of overtime, and there a fight must be waged in the union over the discriminatory impact of this setup in which “B” workers and casuals get the short end of the stick. However, there are sections of the ILWU, notably steady man crane operators with triple-digit incomes, who constitute a genuine “labor aristocracy,” as Lenin described it. Many are ideologically loyal to capitalism, and anxious to protect their privileged position at the expense of the mass of workers. Although the ILWU still has remnants of its leftist past, it is among this labor-aristocratic layer that the present ILWU officialdom has its base. When the Black Orchid Collective document gets down to a more concrete level, it argues concerning the December 12 blockade that “it was an action done autonomously from the ILWU” and therefore “it was not up to them to decide whether or not it should happen.” This confuses several important points. For starters, under the term “ILWU” it equates the union as a whole with the sellout labor bureaucracy. It also fails to understand that if the ILWU ranks hadn’t respected the Occupy blockade it would have been a total bust. In fact, support by the union membership was key to deciding whether or not the port shutdown would happen. Occupy is a highly contradictory conglomeration. It’s good that this layer of overwhelmingly white, predominantly young people, many of them new to organized protest, wanted to show solidarity with Longview longshore workers and port truckers. Both on November 2 in Oakland and on December 12 coastwide, class-struggle unionists urged longshore workers to refuse to work. The union tops sabotaged this, as pro-capitalist bureaucrats generally do. On the other hand, if the members of Longview ILWU Local 21 didn’t want Occupy to undertake an action, it would have been foolhardy and wrong to go ahead. But the Longview local greeted the Occupy actions. The top ILWU leaders were opposed to a port shutdown on both occasions, and particularly opposed to job action by longshore workers. This was not just to cover their rears legally but because they were feeling the pressure of the capitalist rulers. We have explained before that the January 3 letter by union president McEllrath and the disruption of the Portland and Seattle forums by ILWU bureaucrats were aimed mainly at ILWUers, even more than against Occupy. The ILWU misleaders’ opposition to the Occupy actions undercut solidarity with Longview, and ultimately led them to sign a concessionary contract that threatens vital ILWU gains. A shutdown at the ports should be an action by the workers themselves. 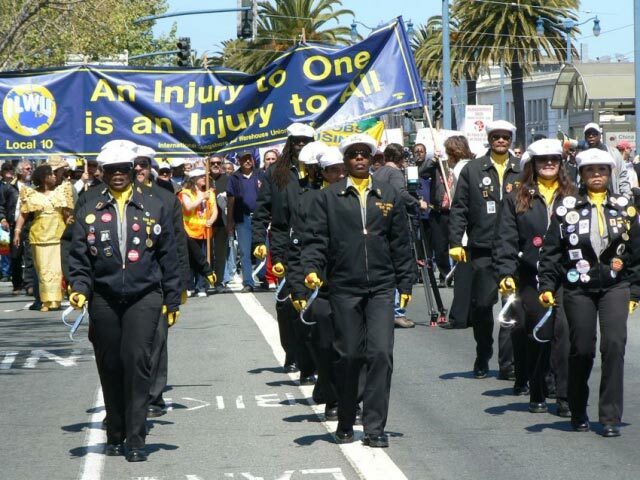 The ILWU has engaged in powerful labor action for political causes, including the 1999 coastwide work stoppage demanding freedom for Mumia Abu-Jamal and the 2008 West Coast strike against the Iraq and Afghanistan war. Local 10 in San Francisco/Oakland also has on many occasions respected “community pickets” for boycotting Israeli ships, protest against the Iraq invasion, solidarity with anti-apartheid struggle, etc. But in every case, the protests were undertaken in consultation with the union ranks. This was not done on the December 12 Occupy West Coast port blockade, which was simply announced to longshore unionists as a done deal. Militant ILWUers should have nevertheless welcomed the Occupy action as an attempt to show solidarity, as many did. But to hold this up as a model is to court disaster. Had port workers crossed the Occupy lines, it would have been a fiasco. On the other hand, Occupy preparations for mass mobilization in Longview to meet the first ship to dock at the scab grain terminal were being consulted with Local 21, with Bay Area Local 10 and rank-and-filers in other ports. That’s precisely what so enraged the ILWU chiefs. In several documents, the Black Orchid Collective claims that Occupy represents “the 89%” of workers who are not in unions. In your dreams, BOC. So who does Occupy really represent? As we have noted, the unusually broad sympathy for OWS stems in good part from the fact that it has not put forward a positive program. Thus Occupy groups have to a degree served as a lightning rod to absorb the energy of the massive discontent among working people and middle-class sectors that have been hard-hit in the capitalist crisis, and lead it nowhere. But Occupy groups don’t represent anyone but themselves. Furthermore, far from “hating” organized labor (as the right-wing bourgeois press pretends, and anti-union anarchists echo) many in the “89%” would dearly love to be in unions. This is something that “class-struggle anarchists” and anarcho-syndicalists like the IWW at least understand, as well as the crucial distinction between the union rank-and-file and the sellout leadership. Moreover, some among them are getting fed up with the anti-labor crap being put out by sections of Occupy. The idea that the unions cannot “exceed the limits set by 20th century labor laws” and the Occupy movement can reveals deep democratic illusions, and more specifically illusions in the Democratic Party. The Occupy December 12 blockade broke numerous laws, and the main reason its lines weren’t dispersed by the cops in Seattle, Portland and Oakland is that city administrations instructed the police not to try to stop them. Democratic Party politicians were worried about the political hit they would take with another bloody confrontation as in Oakland last October 25. But they could have made the opposite decision. The American ruling class is the most murderous in the world. Certainly the pro-capitalist labor bureaucracy cowers in fear of violating labor laws which hamstring the unions’ ability to struggle. But far from representing the unions, such craven leaders undermine them. 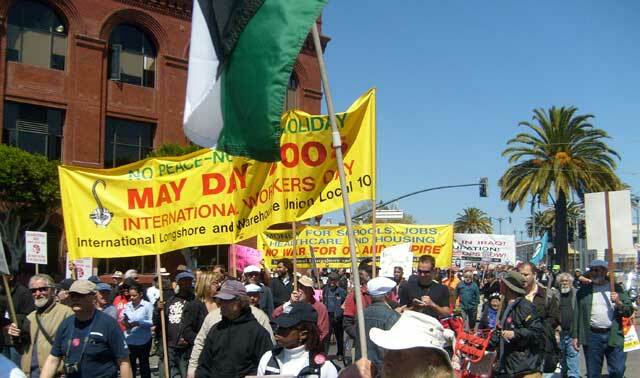 When the ILWU membership forced through the decision to hold a May Day 2008 strike to stop the wars on Iraq and Afghanistan, the maritime employers’ Pacific Maritime Association sued the union for violating Taft-Hartley Act provisions against political strikes. But because of the longshore union’s tremendous industrial power it was able to force the bosses to drop that legal attack unless they wanted to face an extended strike over the contract. The Occupy movement does not have that power – it is essentially an extended demonstration. And when didn’t union militants face anti-labor laws? Back in the early 20th century when the Industrial Workers of the World were organizing on the West Coast, they were jailed in free speech fights from Missoula to Spokane and San Diego just for trying to agitate for unions. In 1918, Marie Equi was jailed under the Sedition Act for giving an antiwar speech in the Portland IWW hall. At the same time, employers enacted “criminal syndicalism” laws in Idaho, Oregon, Washington, California and elsewhere which banned everything the Wobblies did. But that didn’t stop the IWW from organizing labor unions. On the contrary, they organized unions that defiantly violated the bosses’ laws, and for that they were constantly in and out of jail. Nor is the rise of a “precarious proletariat,” or “precariat” as some in Europe are calling it, a new phenomenon that makes unions obsolete. Read Friedrich Engels on The Condition of the Working Class in England in 1844, or about unemployed workers riding the rails from the Midwest to California in search of work during the 1930s Great Depression. Workers holding long-term jobs is a relatively recent phenomenon, basically since World War II, and the result of union struggle. But lack of steady employment didn’t sour workers on unions. Bud Simons, the Communist Party worker who led the Flint sit-down strike in 1937, had previously worked in 13 different auto plants before ending up at Fisher Body No. 1 and making history. As for unions in the U.S. today being on the verge of extinction, as the BOC argues, they are certainly in bad shape. The labor lieutenants of the capitalist class, as Daniel De Leon accurately described the labor bureaucracy, would rather see the unions they preside over go down than break the bosses’ laws. That’s why we have to get rid of the bureaucrats, not the unions whose defense they are sabotaging. Remember, as T-shirts worn by labor protesters in Wisconsin proclaimed, it was unions that brought you the weekend. When you get right down to it, by writing off the unions, supposedly radical anarchists end up siding with the employers. So what is to be done? Workers have gone through periods of defeats before. In the 1920s, union membership fell to barely 5% of the workforce (compared to 12% today). Most strikes in the early years of the 1930s Depression were smashed, up until 1934. In that year, a series of citywide strikes (longshore in San Francisco, Teamsters in Minneapolis, auto parts workers in Toledo), all led by “reds,” broke the cycle of defeat by defying cops, courts and martial law imposed by the National Guard. This laid the basis for the explosion of industrial unionism in 1935-36 when millions of workers flooded into CIO and AFL unions. Drive Out the Bureaucrats – Break with the Democrats! The conclusions drawn by the Black Orchid Collective are wrong, its analysis is skewed, but the issues are real. These anarchist and semi-anarchist radicals clearly do not have a Marxist understanding of the labor bureaucracy, which is the key obstacle to militant workers struggle. Either they bandy about the term bureaucrat around as an insult, or they apply it to anyone who is an elected official of a bureaucratic organization. Yet there is a big difference between leaders of ILWU Local 21, for instance, none of whom receives a salary and who carry out union duties in addition to working on the docks, and top ILWU bureaucrats in their cushy posts who seek “partnership” with the maritime bosses. The BOC document on “Longview, Occupy and Beyond” shows some familiarity with, and misunderstanding of, Trotskyism. Misidentifying the ISO as “part of the Trotskyist tradition,” it cites Trotsky’s thesis from the Transitional Program that the crisis of the working class is a crisis of leadership. But the BOC then concludes that for Trotskyists, the problem is “to replace the leaders they think have sold out with new leaders who they think will lead the union to struggle more effectively.” (At the same time, it recognizes that “Many other Trotskyists would argue that the ISO betrays their tradition when it fails to challenge current union leaders concretely, directly, in practice.”) However, Trotsky’s analysis and program went much further. “The problem is not just with the current leaders. Replacing them with new leaders through organizing inner-union reform caucuses will not solve the problem,” writes the BOC. True enough. So what is the problem? Saying that its critique is not of individual leaders, the BOC points to “the structure of the unions which are shaped by and bound by anti-labor laws in this country.” It is certainly true that the unions are “shaped by” the web of anti-labor laws, but they are not bound by them: that is the question of leadership. And that is why genuine Trotskyists do not call for simple trade-union reform caucuses but for organizing a revolutionary, class-struggle opposition to oust the pro-capitalist labor bureaucracy. The BOC argues that workers committees would be a better vehicle than ossified and bureaucratized unions. So would soviets (workers councils). But such organizations, which can more accurately transmit the will of the working class, only arise during exceptionally intense class struggle. At the height of the working-class mobilization in Wisconsin in February-March 2011, our call for a general strike was coupled with the demand for the election of strike committees, which would necessarily have gone beyond a narrow union framework. But the class-collaborationist leaderships of the workers movement blocked class struggle and led to the victory of reaction. Note also that in Wisconsin, neither the ISO nor the syndicalists of the IWW challenged the left-talking union bureaucrats of the South Central Federation of Labor who first suggested a general strike and then dropped it in favor of the Democrats’ recall drive. The central issue is not so much the structure of unions, but a matter of leadership and program. What is key is not some empty “rank-and-file” structure but forging a cadre of class-struggle militants to defeat the pro-capitalist bureaucracy politically, and then reorganize the unions from top to bottom to turn them into instruments of class struggle governed by workers democracy. To accomplish that requires, first and foremost, building the nucleus of a revolutionary workers party to lead the fight. This lesson has been confirmed over and over by history. Far from invalidating it, the sudden appearance of a new mass phenomenon like Occupy Wall Street underscores the need for a conscious vanguard. As it is, the Occupy movement is going nowhere, precisely because of the wildly divergent nature of its supporters that made its explosive growth possible in the first place. As Trotsky wrote in a 1937 article, “The law of the parallelogram of forces applies in politics as well.... When political allies tend to pull in opposite directions, the resultant proves equal to zero” (“The Lessons of Spain: The Last Warning”). Every few years since the demise of the Soviet Union a new movement has suddenly appeared out of nowhere and quickly found supporters and imitators everywhere. On New Year’s Day 1994 the Zapatista Liberation Army made its debut in Chiapas, Mexico. Soon the whole left was avidly reading the declarations of the Lacandón Jungle and the “intergalactic communiqués” of Subcomandante Marcos and talking of “making the revolution without taking power.” Yet the Zapatistas’ strategy of “autonomy” has only left them isolated and mired in overwhelming rural poverty. A few years later, in late 1999 came the “battle of Seattle” protests against the World Trade Organization that gave rise to the “anti-globalization” movement. As the embrace of protectionist labor bureaucrats became too embarrassing, this morphed into the “alternative globalization” or global justice movement and world social forums. After bloody repression of protests against a G8 meeting in Genova (2001) and as protests petered out, leftists began talking of an “anti-capitalist” movement, but one which would not call for revolution or socialism. At most they opposed “neo-liberal” free trade policies and yearned for a return to the (capitalist) welfare state of yore. The Occupy movement is the latest variant of this phenomenon, following on the heels of the indignados in Spain/Portugal and aganaktismeni (outraged) in Greece who occupied city squares, which in turn was inspired by the “Arab Spring” that brought down dictators (but not the dictatorship) in Tunisia and the Egypt in early 2012. What all these movements have in common is their bourgeois populist politics, focusing on hated symbols (the local strong man), social ills (corruption, growing inequality) and policies (“neo-liberalism”) rather than going to their origins in the capitalist system. Occupy Wall Street talks of revolution, even “world revolution,” but what they are talking about is “true democracy.” More specifically, they mean bourgeois democracy, because while OWS criticizes “corporations, which place profit over people,” they are not talking about a revolution in the ownership of the means of production. Why not? For one thing, because the initiators were largely petty-bourgeois, many of whom harbor hopes of becoming business owners (as some already are). OWS working groups include alternative banking, cooperatives and other initiatives which defend small capital against big rather than opposing capitalism. With their purely democratic politics, they all purvey the illusion that it is possible to change these injustices without a social revolution through class struggle. This is just as true of the tactically more militant anarchists as of the liberals and reformists. If Lenin referred to the Narodnik anarchist-populists of his time as “liberals with bombs,” the anarchist black blocs of today are liberals in bandannas who engage in ritual street battles with the cops in hopes of awakening popular sympathy and at most smash or spray paint a few windows. Such antics can never bring down the capitalist edifice; workers’ struggle, with revolutionary leadership, can. While Occupy Wall Street began as a liberal-anarchist coalition, it was met with a largely spontaneous outpouring of protesters numbering in the tens and even hundreds of thousands. They came out because they were fed up with the conditions, many of them because they didn’t see the “change” promised by Obama. But spontaneous popular protest does not provide the consciousness and program necessary to actually smash the power of Wall Street. As the Occupy movement polarizes along moderate/radical lines, neither side can provide a way forward. We are facing formidable foes who have all the resources of state power and global capitalism at their disposal. The NYPD and Oakland PD are nothing compared to what the capitalists will throw at us if they feel their rule threatened. This is the ruling class that laid waste to Korea, Vietnam and more recently Iraq and Afghanistan. They will not be defeated by shouting “mic check” or wiggling twinkle fingers, and certainly not by the fickle vagaries of public opinion. They can only be brought down by putting in motion an even more powerful force. That force can only be the working class that produces the capitalists’ wealth, that makes the economy run, and that can bring it to a screeching halt. Replaced by “We, the people” in a second edition. In their article, “The Solidarity We Need for Longview,” Socialist Worker website, 19 January. The Glass-Steagall or Banking Act of 1933 prohibited commercial banks from engaging in investment banking activities, in order to insulate depositors from the kind of bank collapse that occurred in 1929, triggering the 1930s Depression. The key parts of that act were repealed in 1999 under Democratic president Bill Clinton. Some blame the 2008 Wall Street crisis on the “financialization” of the economy, giving megabanks and investment houses undue influence. Yet as we have explained elsewhere, the ultimate cause of the 2008 crisis was a falling rate of profit (“From Wall Street Crisis to International Socialist Revolution,” The Internationalist No. 28, March-April 2009). Today, forces ranging from reformist leftists to right-wing populists (Ron Paul) and the fascistic Lyndon LaRouche call for reinstating Glass-Steagall. See, for example, our analysis, “Lessons of Chicago CORE,” The Internationalist No. 33, Summer 2011.